The piles are mounting. Gear is strewn everywhere. The final load of laundry is in progress. By evening, it will all be reduced to two neat bundles. Small enough to fit on the back of our bicycles. This is our fourth major bike trip in as many years. By now I have this packing thing down to a science. It doesn’t matter if we are going for a week or two months, the list is the same. So it should be smooth sailing through these final days before the trip, right? Not always so. Getting our bikes tuned up before any major trip is one of our requirements. Last week we dropped them off for their maintenance visit, expecting a routine job. So imagine our surprise when they called the next day to tell us that Rich’s bike was toast. We rushed down to observe the damage, and sure enough the frame was “crinkled.” We’re still mystified by how that happened. But thanks to some fast work on the part of our bike shop and a major withdrawal from our bank account, it was remedied with the rapid delivery of a new bike. Same make, same model but a much prettier color. And a potential calamity averted. As always, we will be traveling in uniform. 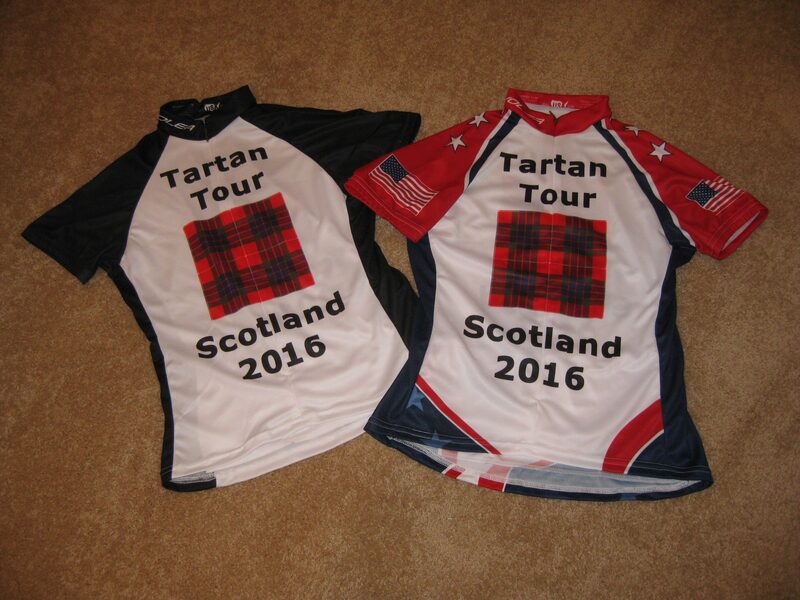 Rich designed this year’s jerseys as a tribute to his mom’s Scottish heritage, using the Fraser plaid. Unfortunately, there was a mistake in our order, and they only made one of Rich’s shirts. We’d all but given up on getting the final jersey in time, when the UPS truck pulled into our driveway late this afternoon. Success! We’ve both set up our blogs to post about this adventure. And already we’ve gained some attention. 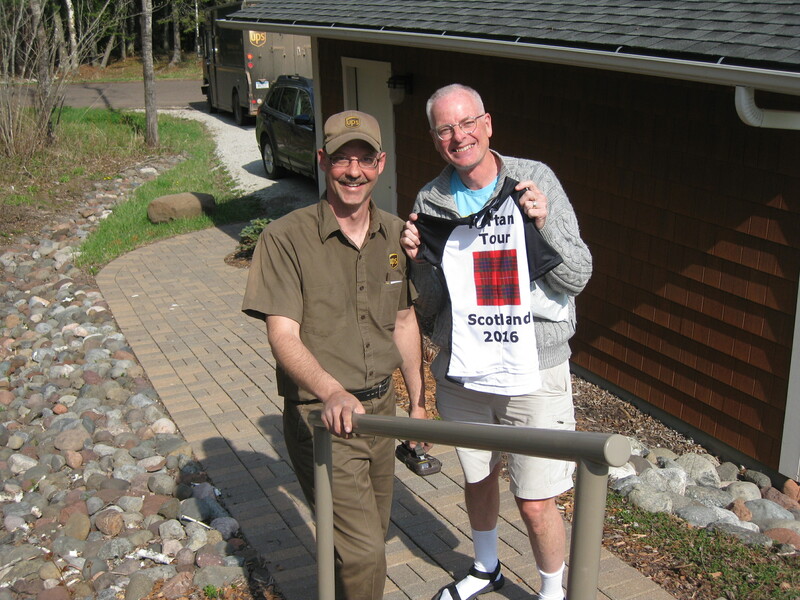 A man in Aberdeen Scotland noticed Rich’s trip journal entry on CrazyGuyonaBike and contacted us. A Skype session ensued, in which he dispensed some great advice and has even volunteered to cycle with us to help find our way on the first day. What great people we find in the cycling community! We also gained a few moments of glittering fame when our cycle touring hit the local newspaper. 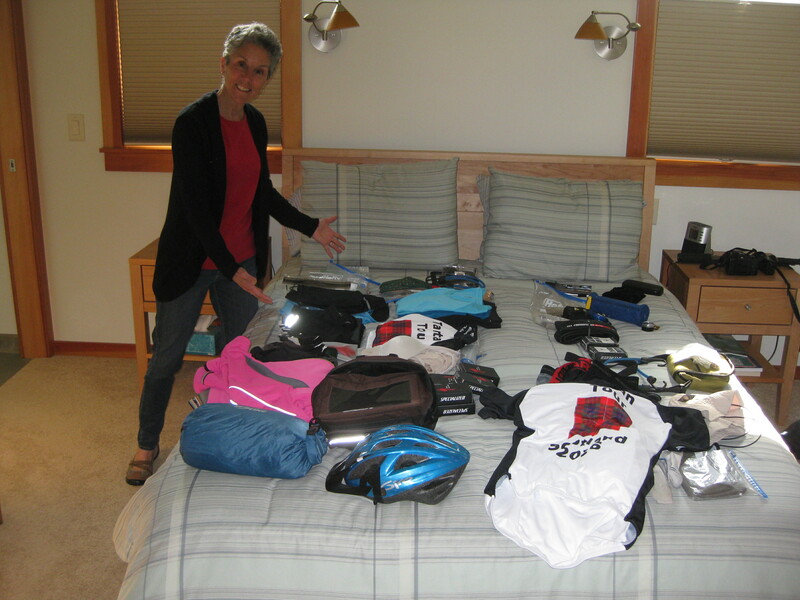 Outdoors columnist, Sam Cook, asked to interview us and wrote a great story about our retiree cycling adventures. For me, it was interesting to be on the other side of the interview questions for a change! Soon all the pieces will be in place. Baring any other last minute surprises, tomorrow we’ll hand our home over to our house sitter and take to our bikes in exchange. Scotland, here we come! This entry was posted in Keeping Fit, Travel and tagged Cycling, Cycling Trip, Scotland Tartan Cycling Tour, Travel by Molly. Bookmark the permalink.